What would you do if your estranged, homeless, alcoholic father suddenly showed up at your door? What if you knew in three weeks you would be saying good-bye to him forever? One daughter knows deep down that her only choice, for the sake of Christ, is forgiveness—but how? Adult children of alcoholics and addicts live caged in guilt, shame, depression, and other self-destructive thought patterns. 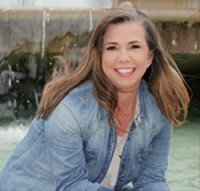 In Three Weeks to Forgiveness, author Kimberly Dewberry addresses distinctive ways to identify forgiveness and create a healthy life through Jesus Christ. With real and raw reflection to empower those dealing with addicted parents, the author encourages readers to overcome the familial cycle of substance abuse and its devastating effects. 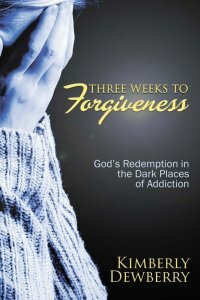 To help others who struggle with the devastating effects of addiction in their lives and to point them to Christ. I began writing Three Weeks to Forgiveness in January of 2016. Although I finished the first draft in May of 2016, the professional editing process took the rest of 2016 to complete. My editor and I wanted to ensure Three Weeks to Forgiveness was the highest of quality for the reader. Since it is Christian non-fiction, I also had Three Weeks to Forgiveness reviewed for theological content from someone with a masters degree in theology. What was your publishing process like? How did you publish your book and how long did it take? Once the edits were complete and I created a one-sheet, I sent it out to many agents and publishers. While this process, at times, was daunting, in the end it was worth it. In a last ditch effort, I submitted the manuscript to a small press and a month later they reached out to me. eLectio Publishing has been great to work with. The ultimate goal of Three Weeks to Forgiveness is to show the reader that even though we may turn from our Christian faith and our walk with Christ, He never leaves us. In fact, He pursues us and uses our past heartaches and mistakes to show us if we turn to Him, He will redeem us. I have wanted to be a published author for most of my adult life. I began writing seriously over 15 years ago, but my reasons for writing were much different than they are now. Then, I wanted to be published for selfish reasons. To have notoriety, to be famous, if you will. Now, I write because I believe I have a message that is important for the world to hear. I write to help others. Sitting at the computer and creating. That is the most fun to me. I also enjoy interacting with readers. When I receive an email, out of the blue, from someone who has read my work and they share how it has blessed them or made them think about things differently, that is the ultimate joy. I would have to say Mary DeMuth. She is not only a wonderful author, but she is a woman of great faith that has overcome things in her past with God as her helper, Father, and her friend. I love her writing and her spirit. My husband and I are currently working on a book together. This book’s goal is to help couples as they deal with addiction in the marriage. Don’t give up. No matter how long it takes, if you have a message inside of you the world needs to hear, then pursue it! Just sit down and write!